What do faith, science, church services, zip lining, rock wall climbing, and "Minute to Win It" have in common? To an average person the answer would be “nothing!” However, if you were to ask the participants of this year’s Annual Lenten Teen Retreat held at the Taconic Retreat Center in Milan NY, they would be able to tie each of these elements together; they were all components of the event held from Friday, 1 April to Sunday, 3 April 2016. Archbishop Michael, together with Father Jason Vansuch (Chairperson, Department of Youth Ministry), Danielle Geeza and Janine Alpaugh (Department of Youth Ministry Assistants) developed a wonderful weekend program centered on the sometimes controversial topics of “Faith and Science” and how they need not oppose each other. Peter Parsells, MS, PA-C and Heather Parsells, MD, led the educational sessions during which they shared their testimonies as two Orthodox professionals in the field of medical science. As medical professionals, husband and wife, Peter and Heather are extensions of God’s grace. Heather, a pediatric anesthesiologist, sees new life every day. Peter, a neuroscience physician assistant, witnesses God's healing presence through medical evaluations and procedures. Together, the couple compared and contrasted what it means to be a person born into Orthodoxy who came to discover the joys and wonders of science (Peter), versus a person rooted in the academics of science who later came to find the Orthodox Faith (Heather). In their testimonies, participants learned we can be people with immense scientific intelligence who are still grounded in our faith! They also entertained questions from participants. A quaint chapel was assembled in the upper-room of the retreat center’s main building on Friday afternoon. Participants arrived for registration, pizza, and icebreaker games later that evening. The group was blessed to have Archbishop Michael preside at Saturday’s Memorial Divine Liturgy with Father Jason and, later in the evening, at Great Vespers. 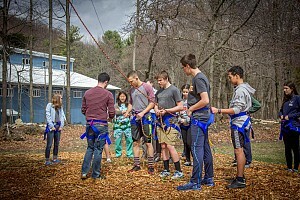 During their free time on Saturday the teens collectively played a heated game of basketball, but only after having climbed the retreat center’s outdoor rock wall and zip-lining through its wooded property -- a highlight of the weekend! Following Vespers and dinner, the group was divided into two teams and played “Minute to Win It,” a fun-filled competitive game coordinated by Janine and Danielle and modeled after the popular TV show. Participants stayed up late into the evening as they watched the movie “Do You Believe?” with Archbishop Michael, and then proceeded to have an informal Q&A session with their diocesan hierarch. On the Sunday of the Veneration of the Cross, Father Jason served Divine Liturgy following a lesson on the service of preparation of the bread and wine, the Proskomedia. The scent of incense lingered in the air after each service throughout the weekend, leading many non-Orthodox from other visiting groups to sit in meditation taking in the beauty of our icons and peaceful environment. 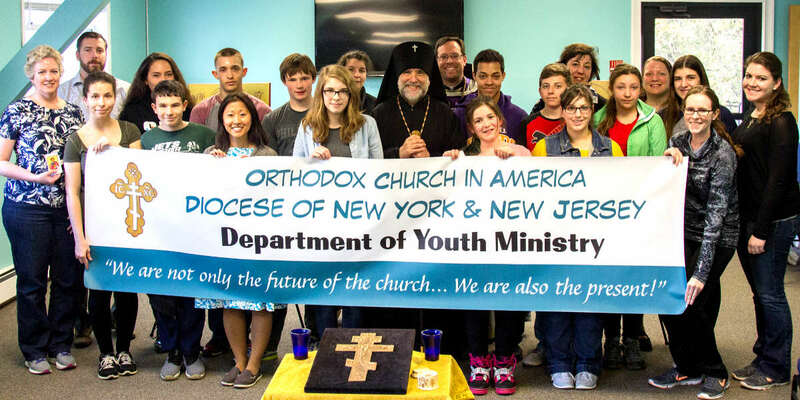 After Sunday breakfast the weekend came to a close with participants feeling spiritually renewed and having gained many new Orthodox friends! The Department of Youth Ministry is excited to announce that the next Lenten Teen Retreat is scheduled for March 2017, specific date and location to be determined.